When I walked into Park Avenue Winter, I was dismayed to find that it was no longer Autumn! Were we no longer in the Fall season?! Not only that, but I was also informed that there were no warm cocktails on the menu on this frigid rainy still technically Autumn day. Troy, the mixologist the day we went in, made up for it by making me a Hot Toddy off the menu, and the following dining experience made this my #FoodCrushFriday. 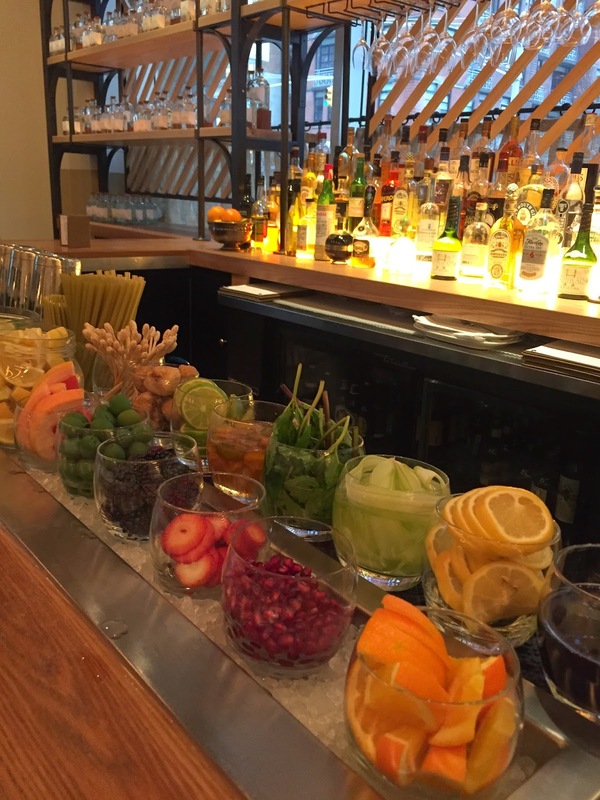 The bar is lined with fresh ingredients, an indication of the quality of ingredients that go into the seasonal cocktails. We started our meal with a complimentary bread dish. 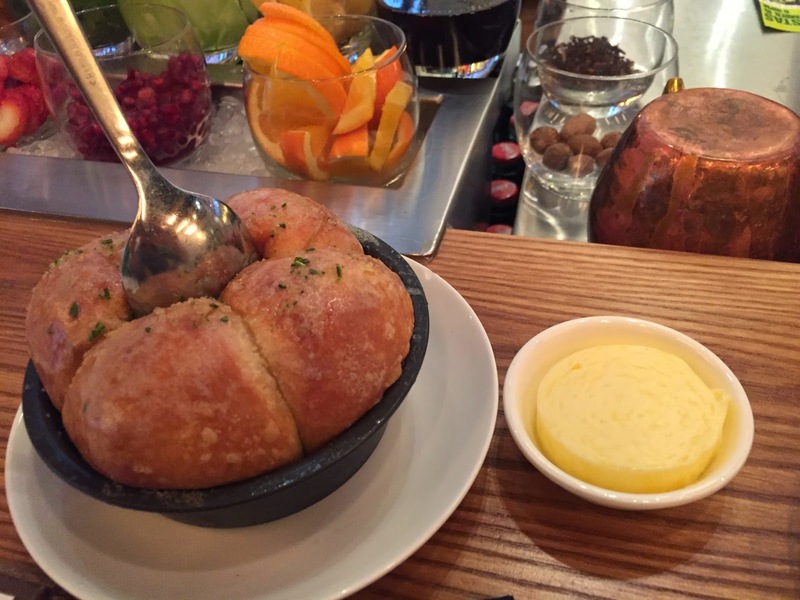 The caliber of this bread had set the bar so high that I could only imagine how the rest of the meal was going to be! The bread had a crispy exterior and soft and luscious interior, and was topped with a pinch of rosemary and salt, which made all the difference. One of the staff members, Oscar, had to come over to see what I was eating because it looked like I was "having a moment." He was surprised that it was just the bread, but for me that is typical! What's great about dining with friends is that you can get more food! We decided to start with the Crispy Octopus and Black Chickpeas Salad, which was dressed with Burnt Caramel Vinaigrette and Lemon Preserve. As someone who cannot really handle anything spicy, I must warn you that there is a kick to this salad, but it's bearable. 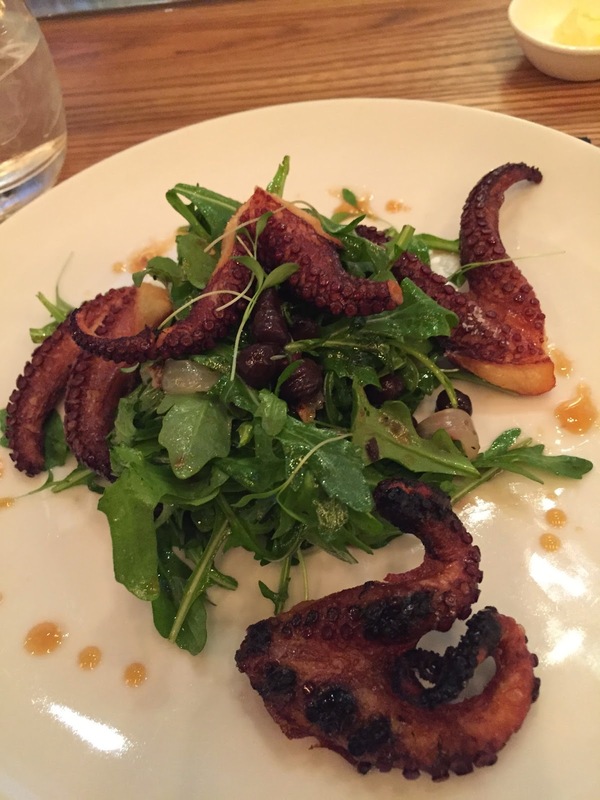 The octopus, which was a good size and texture, was flavorful and paired well with the chickpeas. 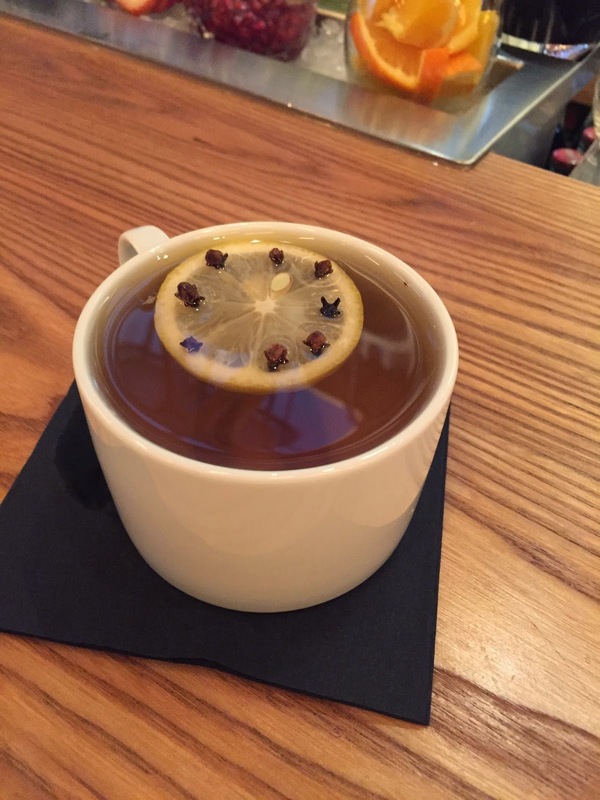 The Hot Toddy, which went down far too smoothly, needed to be followed up with another beverage before our next course. 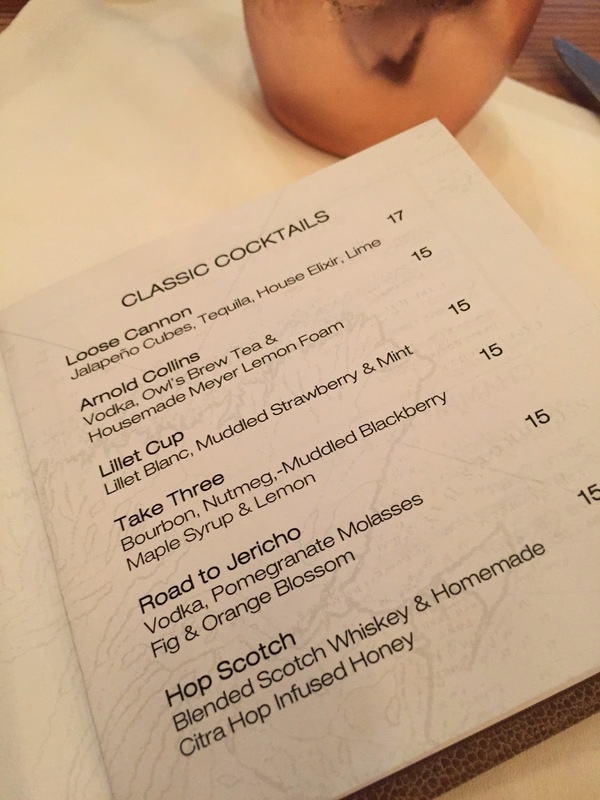 With Troy leading my choices, I decided to try the Road to Jericho, a delightful mixture of Vodka, Pomegranate Molasses, Fig and Orange Blossom. This concoction lasted me the rest of my meal! 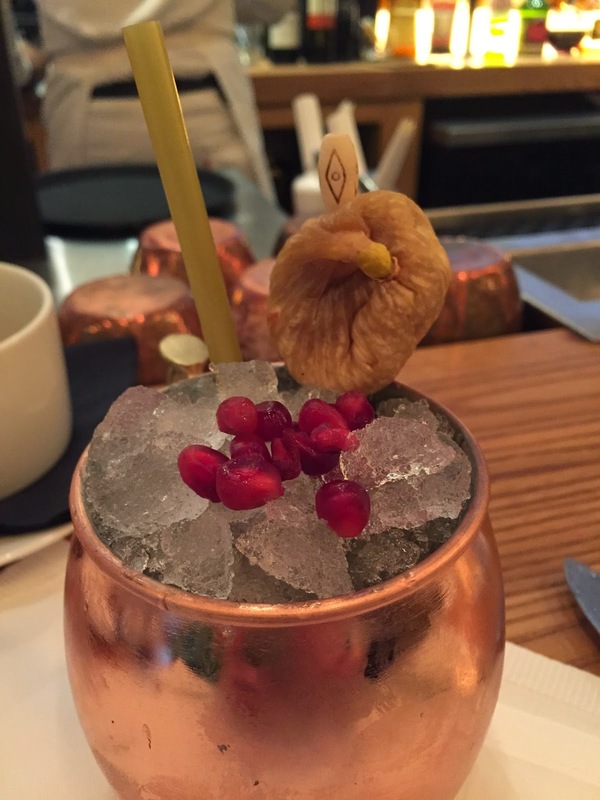 It's also served like art with a dried fig and pomegranate seeds atop a copper mug. 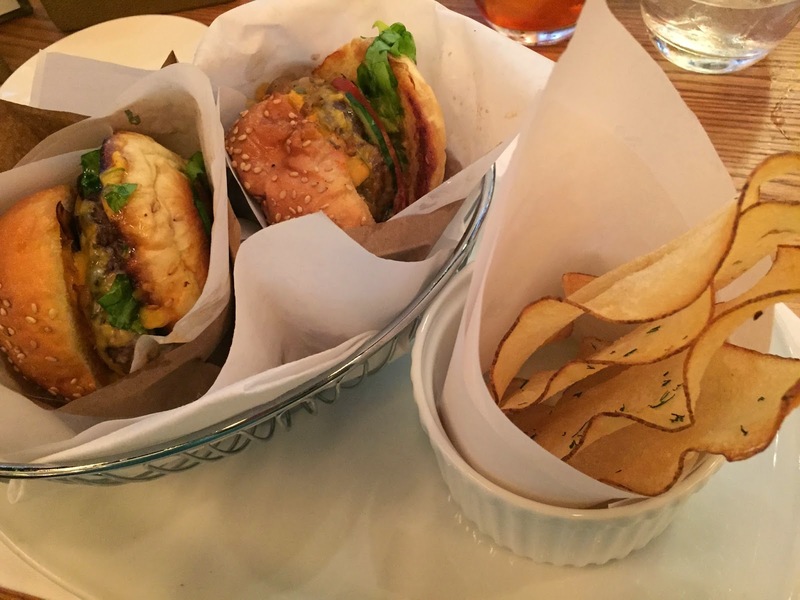 We moved onto our second course and the reason we came in for lunch, the Park Avenue Burger, served, "In 'n Out Style." This is one of few offerings only available during the daytime. I have read the countless reviews for this burger and have tried burgers at multiple locations, including, In-N-Out Burger, so I can see the sentiment for the positioning of the burger. However, my expectations were skewed and I didn't like the burger as much as I would've because of the description. Don't get me wrong, the burger was the bees knees, cooked perfectly with an array of fresh toppings. I just would've liked the bun to be less brioche to fit into that particular style of burger I anticipated. 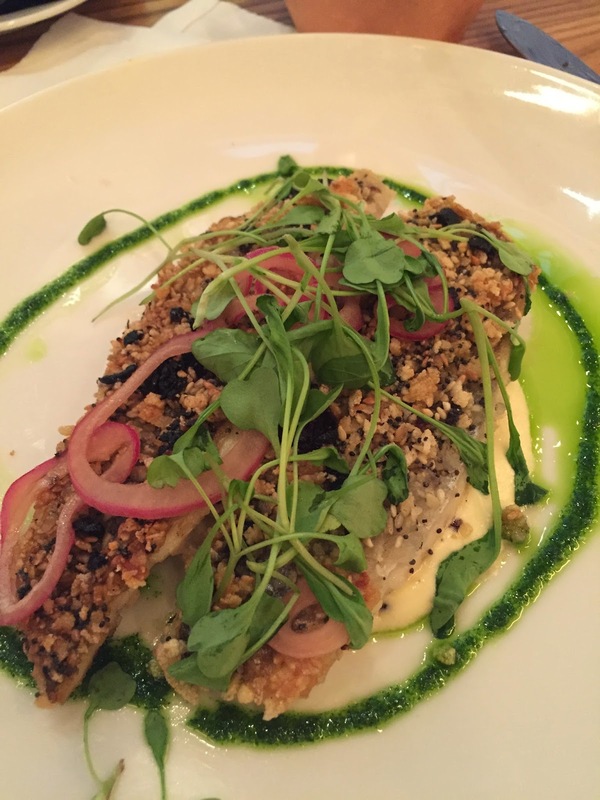 We then moved on to what would become my favorite part of the meal, the Everything-crusted Branzino, with Smoked Cream Cheese and Pickled Onions. We figured this is Park Avenue Winter's take on a bagel with lox. Mission accomplished! The crispiness of the everything crust with the flakiness of the fish and layer of cream cheese sauce on the bottom was everything! The pickled onions also added a great acidity to the dish and a welcome flavor combination. I finished this course and looked back on the experience with fondness! 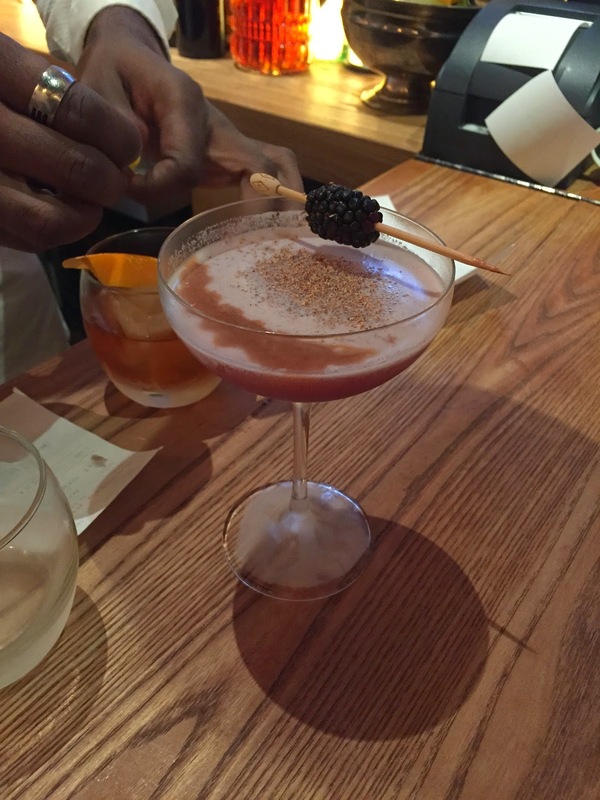 As we were waiting for the dessert that Troy insisted we have despite being quite satiated, I got a glimpse of the Take Three; Bourbon, Nutmeg-muddled Blackberry, Maple Syrup and Lemon. A night cap I will need to have when I don't have to get work done after the meal! The presentation was absolutely flawless. I can see how this fits into the winter category because all it needed was a bow to be the type of present I'd want under my tree! We ended on a sweet note with the Winter White Sundae. We were informed that the lunch portion is smaller than the dinner portion, which we couldn't fathom considering how rich and decadent this amount was! 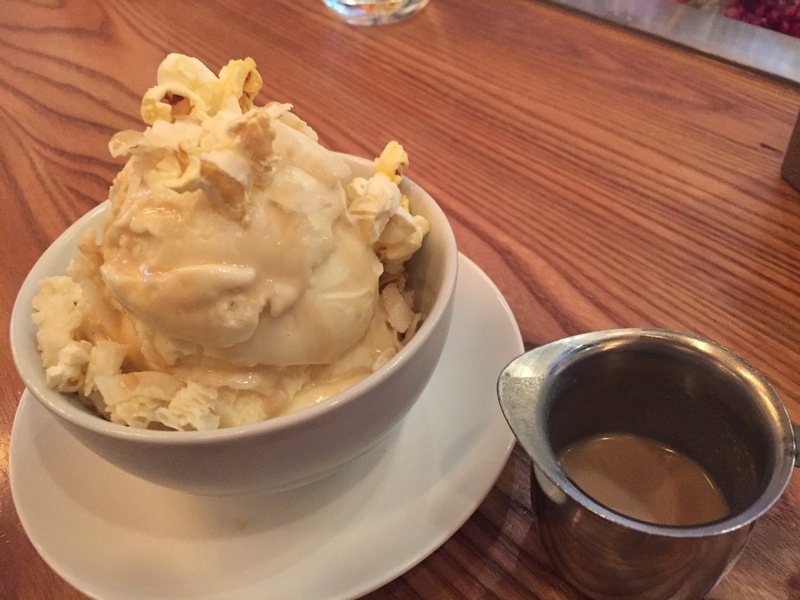 The dessert is comprised of Popcorn Ice Cream with a Coconut and White Mocha Sauce that is poured on table side that you can add more of if you'd like. The combination might not be traditional, but that's what I liked about it. The flavors worked together in perfect harmony. Overall, this place is like a winter wonderland. I loved coming here for the seasons when it was up on 60th Street, and I know I'll love coming back now. 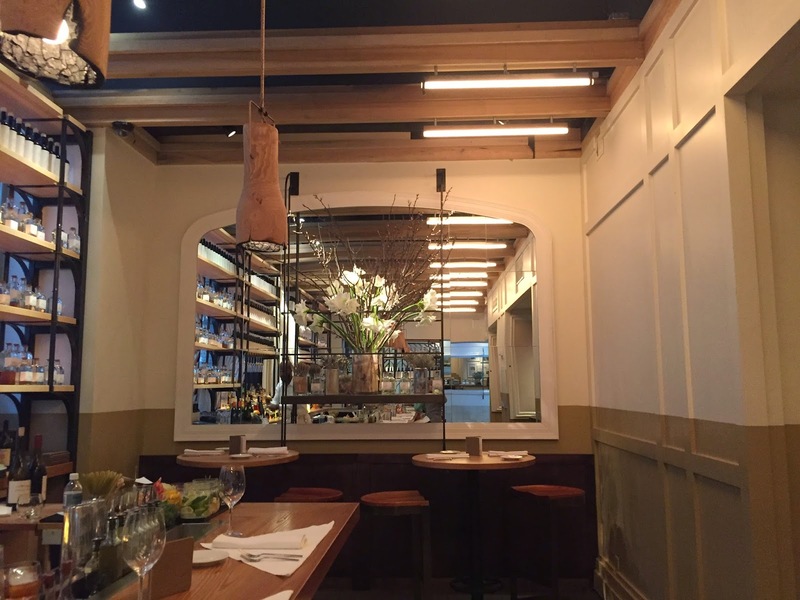 The decor and ambiance is quite magical, as are the food and cocktails. Don't even get me started on how personable the staff is and how I want to BFF with every one of them. We got a sneak peek at the dinner menu and already racked up a list of items we need to try/ a reason to come back and put in our bestie applications. 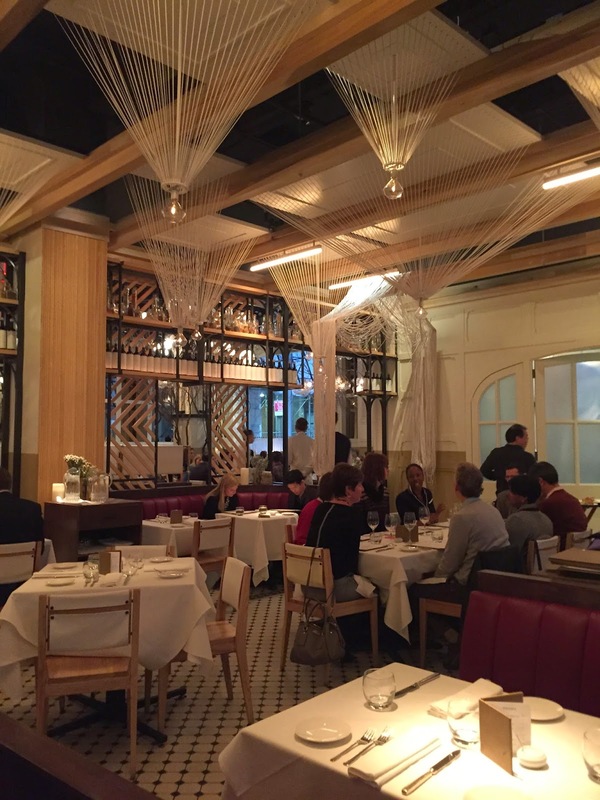 So go to Park Avenue Winter and let me know what you think. Do you agree with my breakdown and the # FoodCrushFriday title? 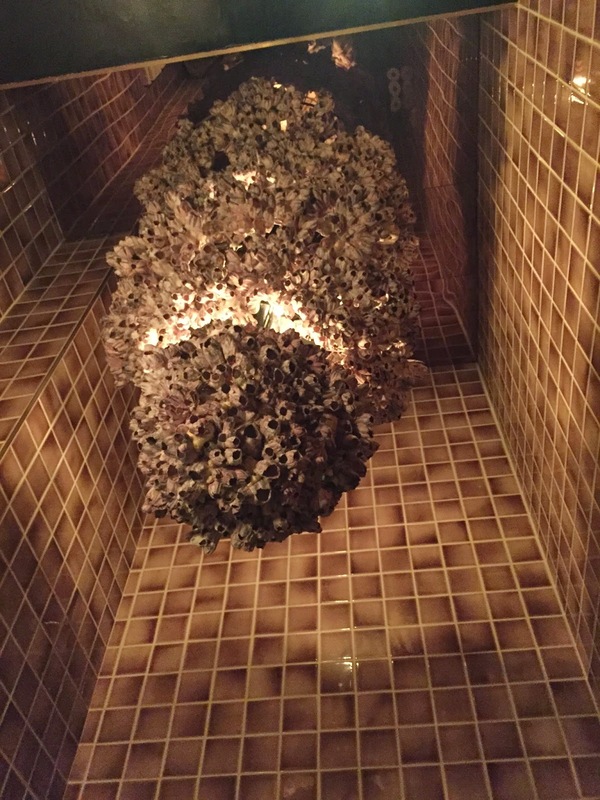 Also, if you go into the bathroom, don't forget to look up!